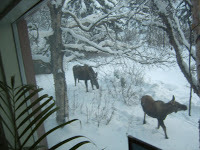 So far this winter the sightings of moose in Anchorage, Alaska, around Camai Bed and Breakfast have been numerous. Sean and Pele, Darwin’s parents, sent many of these pictures from their stay at Camai Bed and Breakfast this past January. Some of the pictures posted were taken by Craig from inside Camai B&B. One picture shows the van where Darwin and his parents were taking pictures of the same moose. From a previous post I expressed my wish that Darwin could see moose during his Anchorage visit to see his great-grandmother. 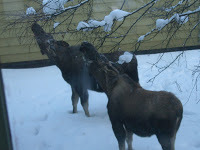 Darwin saw approximately ten different moose while he was in Anchorage. In the beginning it was exciting to see the moose. Toward the end of his visit it had become rather “ho-hum.” Darwin’s grandmother was “the high number of moose sightings” winner with 12 different moose…pretty remarkable within a span of just one week!